Pico de gallo is a quintessential Mexican dish yet we often think pico de gallo is just salsa. It’s one of the few dishes in Mexico that doesn’t have a lot of regional variations. It is always finely diced tomato, onion, cilantro, pepper and lime. You’ll find this fresh salad everywhere in Mexico. It’s sometimes called salsa mexicana or salsa bandera (flag sauce) because the colors mimic the red white and green on the Mexican flag. It’s also very similar to pebre in Chile, which contains aji peppers and garlic, and is eaten with bread or as a condiment for meat. Yet no one can agree why it’s called pico de gallo, which translates as beak of the rooster. Some say it is because the dish resembles the colors of rooster’s feathers. Others believe it is from the act of picking food with your index finger and thumb, which resembles a rooster’s beak. 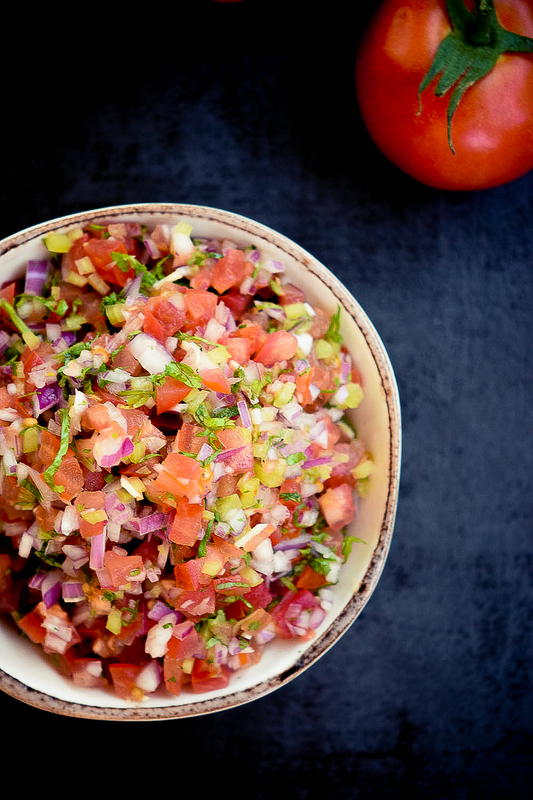 Salsa and pico de gallo are similar but also very different. Pico de gallo is fresh, raw vegetables and never cooked. Unlike salsa which may be cooked or use canned tomatoes. Salsa may be pureed and has much more liquid. Salsa is a dip whereas pico de gallo is a salad and a filling. Salsa is a generic term that means sauce, there can be many different ingredients.Pico de gallo is more of a pure recipe. There aren’t many variations or additions of ingredients. The biggest difference may be the use of jalapeno or serrano peppers or the addition of garlic. Finely chop onion, pepper, tomatoes and cilantro. Put in a bowl and mix well. Pro tip: place chopped tomatoes in a colander with some salt for a few hours. It will remove excess liquid allowing a longer life in the fridge. In Mexico it adds flavour, you’ll see it as a filling on tacos, with shrimp, on eggs at breakfast. It can even replace salsa with nacho chips. It is cheap, easy to make and healthy. But you want to know the craziest part? Some people are actually eating store bought pico de gallo!!! Please put this on your list of things that you will never buy because it only takes 5 minutes to make. Its looking delicious. I like your blog post. Thank you so much for sharing it. Looking so delicious. Thank you so much for sharing it. Really interesting – such a simple but tasty recipe. Never knew about the differentiation from salsa too. Thanks for sharing. Interesting as I actually did think it was the same thing!! Mouth watering food you shared. Thank you so much for sharing it. Pico de gallo is salsa fresca, which is just a type of salsa.